Embossed British stamps were first introduced in 1847. These stamps represent three features that are unique to British philately, the method of die production, the method of printing, and the use of silk thread paper for two of the three denominations. The dies were engraved by William Wyon, who was well know for engraving the coronation medal of Queen Victoria. The working dies bore the letters "WW" and the "die number" at the bottom of each embossed bust. The printing was done at Somerset House. The printing process was VERY tedious. The technology available allowed that only one impression at a time be struck. This meant that the working die had to be used to apply each impression to the printed sheet individually and by hand. This process caused poor spacing of the impressions, usually being too close together or too far apart, and frequently, even being overlapped. This hand-printing process is evident in the block illustrated at the top of this page. The One Shilling (Scott #5) was issued on September 11, 1847. It was printed in Green (shades) on unwatermarked paper with vertical silk threads. 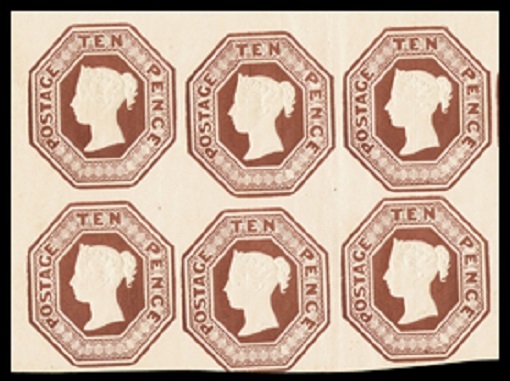 The Ten Pence (Scott #6) was issued on November 6, 1848. It was printed in Brown (shades) on unwatermarked paper with vertical silk threads. 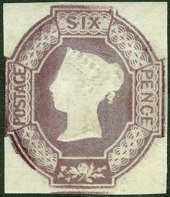 The Six Pence (Scott #7) was issued on March 1, 1854. It was printed in Violet (shades) on paper without silk threads. The paper used to print these stamps was watermarked " V R ". 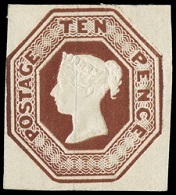 The Six Pence stamps used a tinted gum. The catalog prices for ALL THESE EMBOSSED stamps are for cut-square examples with ample outside margins. Stamps that are cut-to-shape around the edges of the frames have very little value. These three different denominations were produced over a seven year period. With the limited printing technologies of the time, they were eventually deemed unacceptable, and in 1855, they were replaced by new Surface Printed (typographed) definitive postage stamps. 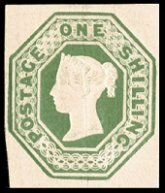 For the specialist, there are many collectible varieties of the British stamps described on this page, including essays, proofs, specimens, printing errors, watermark errors, shade varieties, etc. For details, please refer to the Stanley Gibbons Specialised Catalogue - Volume I - Queen Victoria.